Statue of Spinx, which was in the sand for centuries, was always shrouded in an aura of mystery. Purpose and method of its creation, existence within the hidden cameras, as well as the prophetic gift of the statue and its relationship with the equally mysterious pyramids all still stays unclear. Mostly similar theories advanced desperate Egyptologists and archaeologists, vainly trying to unlock the secrets of the Sphinx alone. Probably, the national symbol of ancient and modern Egypt, standing like a sentry on the plateau of Giza, at all times, playing the same role: the age of the century, excited the imagination of poets, scholars, mystics, and leisure travelers. The Sphinx of Giza is the whole essence of Egypt. The rising sun sculpture of the Great Sphinx is located on the plateau of Giza 6 mile west of Cairo on the west bank of the Nile. The original purpose of the Sphinx is unknown. Nobody knows its original name. Sphinx is the human-headed lion in ancient Greek mythology; the term likely came into use some 2,000 years after the statue was built. There are hundreds of tombs at Giza with hieroglyphic inscriptions dating back some 4,500 years, but not one mentions the statue. It may have been built to symbolically guard over the Giza plateau, and it may have been a portrait of Pharaoh Khafre. Its face seems to bear a resemblance to Khafre’s, and the royal headdress that it wears is particular to pharaohs. The Egyptian people considers him incarnation of the god of the sun, which the Egyptians called Hor-em-ahet (Horus in the sky). Sphinx is part of the necropolis of ancient Memphis – the residence of the Pharaohs, where the three largest pyramids of Egypt – The Great Pyramid of Khufu (Cheops), Khafre (Chephren) and Menkaure (Mycerinus). The monument is the largest of the surviving sculptures of the ancient world. The Sphinx was not assembled piece by piece but was carved from a single mass of limestone exposed when workers dug a horseshoe-shaped quarry in the Giza plateau. Approximately 66 feet tall and 240 feet long, it is one of the largest and oldest monolithic statues in the world. Part of the uraeus (sacred snake, protecting against evil), his nose and the ritual beard deteriorated over time. Beard is now kept in the British Museum. Elongated member on the forehead is a fragment of the sphinx royal headdress. 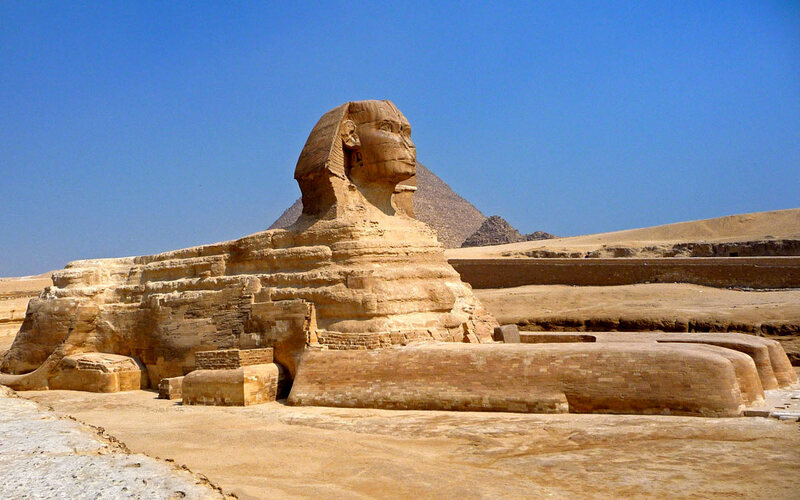 Sphinx has been hit by the ravages of time, human activity and pollution in our time. In fact, the complete destruction of it was saved for a long stay in the desert. Over the long history of the monument there have been many attempts to reconstruct the statue. They started back in 1401 BC., during the reign of Thutmose 4. One day after the hunt Pharaoh fell asleep in the shadow of the Sphinx, and he dreamed that a huge beast suffocated him by absorbing sand statue. In the dream, the Sphinx told Pharaoh that if he pulls out of the beast, and to cleanse it from the sand, it will receive the crown of Upper and Lower Egypt. Today, between the front paws of the Sphinx one can see granite stele (144cm Ht, 40cm W, 70cm D.) which is called the Stele of dreams, which depicts the legend of the dream of the Pharaoh. Although the sculpture was cleared soon it was covered back with the sand. 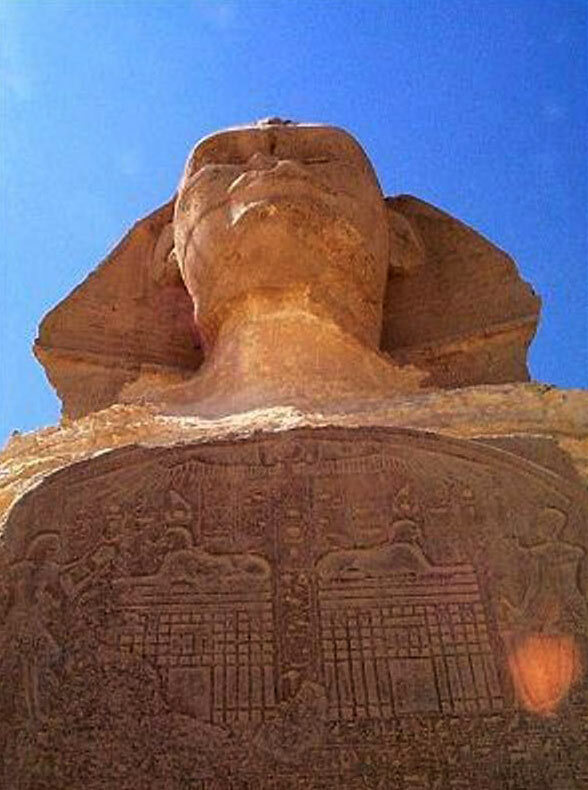 The nose of the Great Sphinx at Giza is conspicuous and created lot rumors with its absence. What happened to it? The popular story is that the troops of Napoleon Bonaparte used the nose for target practice in 1798. 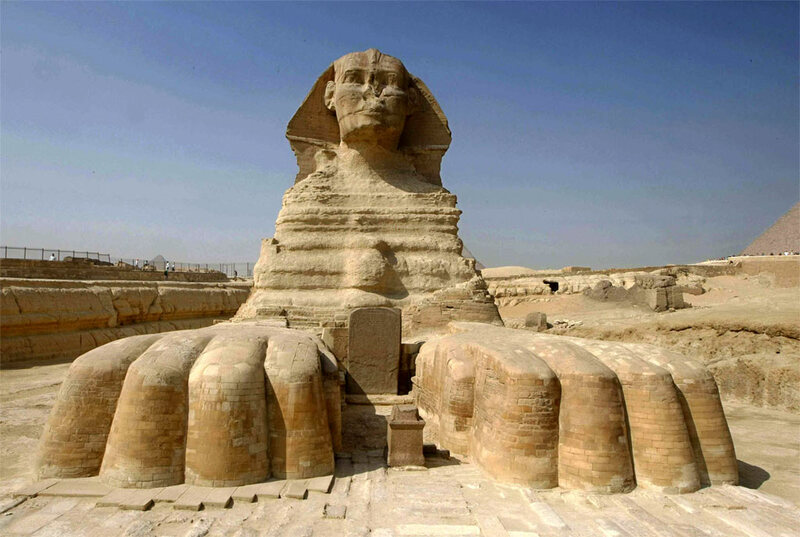 However, some say that when Napoleon arrived in Egypt, the Sphinx was already without a nose. One legend says that the nose cracked in the bombing during the Turkish occupation. According to another version (perhaps more plausible), the nose was probably removed in the 8th century AD by a Sufi who considered the Sphinx a blasphemous idol, but all that can be said for certain, based on the tool marks that remain, is that it was deliberately pried off with chisels. The Sphinx’s face, which in ancient times was painted dark red, was also decorated with a stone beard and displayed a sculpted cobra on its forehead, both of which have also fallen off. In 1858 founder of the Egyptian Antiquities Service Auguste Mariette began excavations in the surroundings of sculpture, but only managed to calculate the part. In 1925-1936 French engineer Emile Baresi, acting on behalf of the Antiquities Service, completed the excavation of the Sphinx. And probably for the first time since the legendary ancient Egyptian sculpture was made available for public viewing. 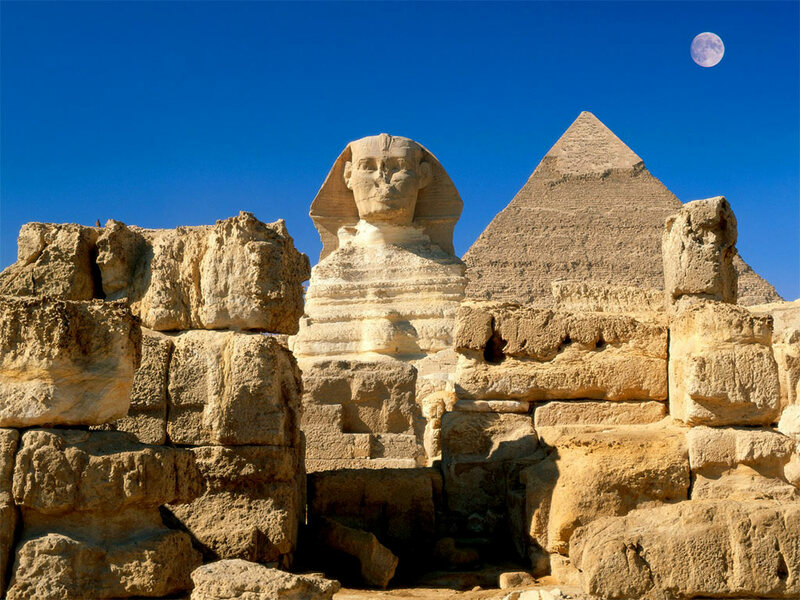 Carved from the bedrock of the Giza plateau, the Sphinx is truly a mysterious marvel from the days of ancient Egypt. The body of a lion with the head of a king or god, it is believed among some people that Sphinx has been built to symbolize strength and wisdom. Even with all of the pictures that we see of the Sphinx online, nothing can really prepare conscious for the time when one will finally see the Sphinx with own eyes.